I still absolutely love the Jungle Creatures fabric line! The colors are so cheerful to work with and the patterns are happy and full of energy. Throw in some cute animals and I just find it irresistible! The center of the quilt is really busy, like maybe I had one too many cups of Pineapple Lychee Green Tea 🙂 But actually when you look at it in person, it isn’t quite as nutty as the picture looks. The borders were my attempt to calm it down a bit. This quilt makes me giggle. I think I am going to ask my friend Sondra if she can quilt monkeys and zebras into my quilt. She can create anything with her long arm machine! Here is a close-up of the fabrics. Aren’t they fun? And my puppy Kevin who stood at the top of the stairs while we took a picture of the quilt. Timmy was standing next to me so no picture this time of him. Linking up with Kelly at http://myquiltinfatuation.blogspot.com/?wref=bif thank you Kelly! Linking up with Lorna at http://sewfreshquilts.blogspot.com/?wref=bif thank you Lorna! Linking up with Sarah at http://confessionsofafabricaddict.blogspot.com/?wref=bif thank you Sarah! 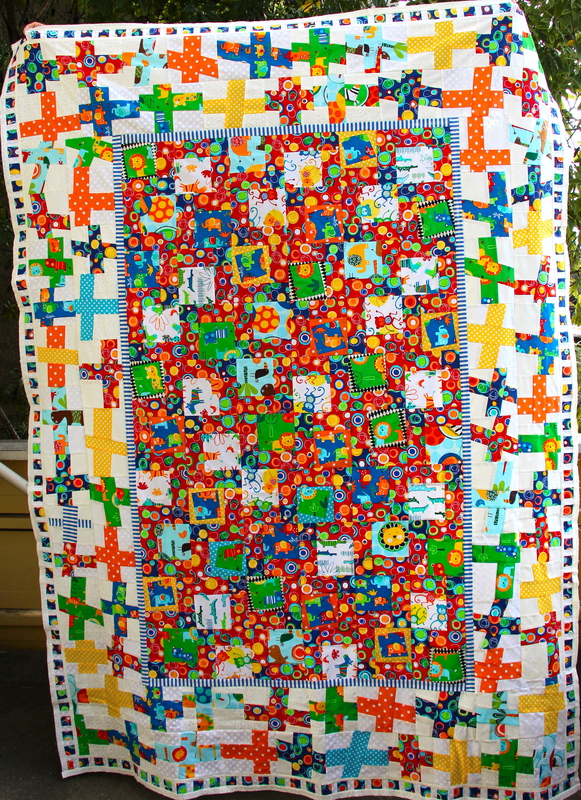 And linking up with Amanda Jean at Crazy Mom Quilts at http://crazymomquilts.blogspot.com/ thank you Amanda Jean! Love it! Kevin has gotten so bigand he is gorgeous! Thanks Jan 🙂 Kevin is such a hoot! 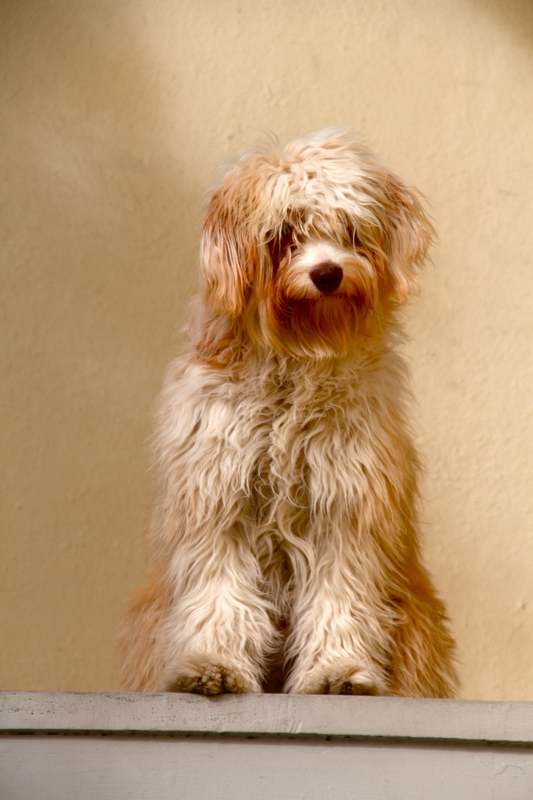 He looks like a beach bum – even when I’ve just brushed his hair. This quilt is looking good.The border works well with the white in it. Hi Karen – thanks 🙂 I think the quilt really needed that white – otherwise it would have been just a colored mush-blob 🙂 (Colors I love of course, but still a mush-blob). Looking forward to seeing your next project! I like the center – I get it. I am a sucker for happy colours and cute animals, too! You did a fabulous job on this top. And if I get to vote… I vote for minky! Looking forward to seeing it all quilted up, Linda. Thanks for sharing! PS. Kevin looks so hug-able! Hi Lorna – thanks 🙂 I am still drooling over your gorgeous Flower Garden Hexagon quilt – and how on earth did you get your spirals to be so perfect! WOW! What a fabulous happy and fun quilt! Love it! 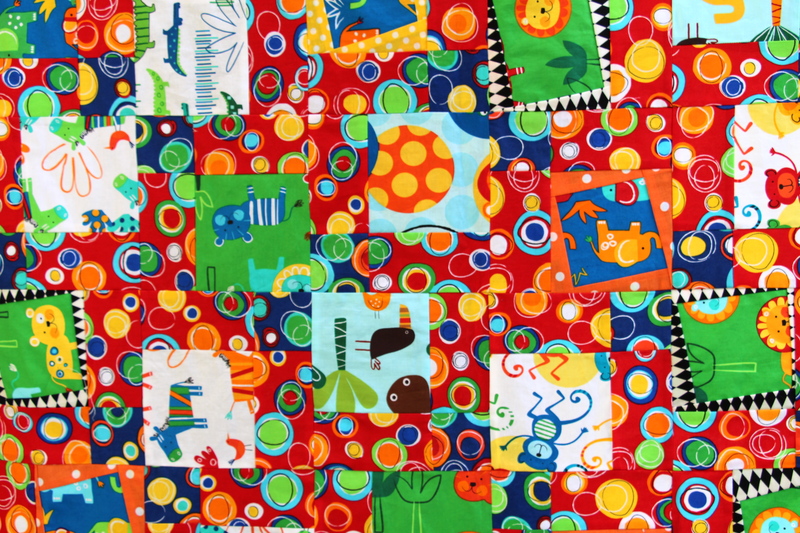 Hi Marie – thanks 🙂 I just love the fabrics and so I tried to make a quilt that showed their fun & silly energy! Seeing your polka dot binding has inspired me to do the same for this one. Great shot of Kevin and now I want to go on a safari! Kevin looks so happy as he is eyeballing the new quilt. He says he wants Minky on the back! Hi Kris – thanks 🙂 I was just over at your site admiring your lava lamps! I love it and it makes me want to giggle too! I would also go for minky for the backing! that is a fun fabric line! perfect for bringing happiness to a child! and your pup is too cute! Thank you Kelly! I am looking forward to making another quilt from the line – can’t get enough of it!